Perfect for.. ICE CREAM & GELATO, OBVIOUSLY! Unlike your usual parlour that begins to grumble when you ask for a couple of tastes, dearest Jen at Grom was SO helpful and patient with us as we took our time to make our decision. She even entertained my hubby and indulged in allowing him a taste of every single flavour Grom has to offer. Grom at Box Park doesn’t have what this outlet has. So what really depressed me is the fact that such helpful and kind individuals are extremely rare to come across. And also that we just don’t give them enough credit for the time they take to make our dining experience special. It’s so important to recognize and appreciate your server, guys. They are working hard and put all their personal struggles aside to give you service with a smile. This takes great effort and speaks insane amounts about an individual. 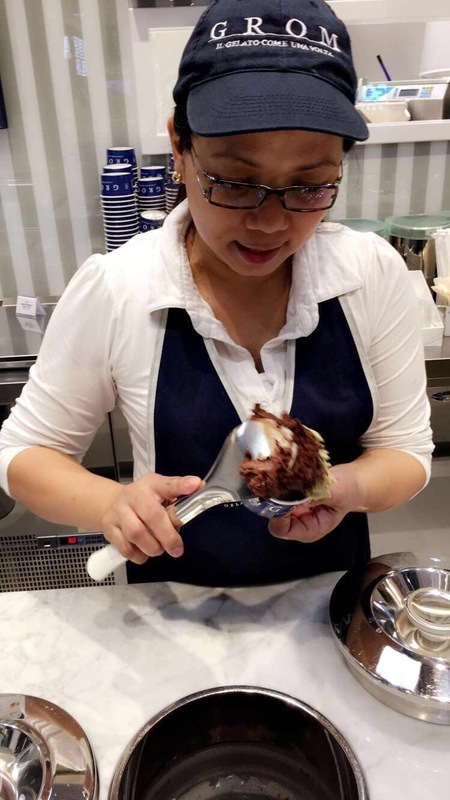 Jen’s amazing service makes me want to drive 20 minutes to Mall of the Emirates every time I want dairy free dessert- THIS is what restaurants really need to be thinking about. Always remember to tip your server!